Get Started Finding The Parts For Your Vehicle? Measure, measure, and then measure again. Whereas all car stereos are seven inches wide, they come in two standard heights, single DIN (Deutsches Institut fur Normung) and double DIN:: Single DIN audio systems are two inches high, making double DIN units four inches high. Only in very rare cases do units come in DIN-and-a-half, or three inches in height. 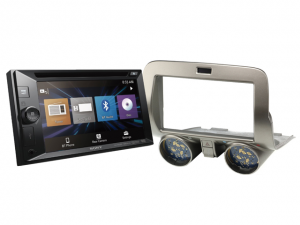 If the sizes are not in agreement, a mounting kit may allow for the installation of a single-DIN car audio system into a double-DIN slot. 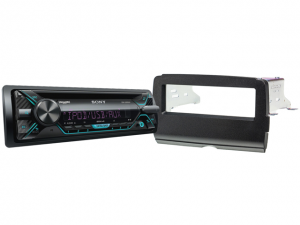 The depth of the unit may vary, as well, making it very important for a buyer to measure his or her present stereo and in-dash capability before making a purchase. The replacement stereo should have an inch or two of clearance behind the unit, allowing space for cable connections and wiring. This unit fits most domestic vehicles, and can be installed with the proper dash kits and mounting harnesses. Get started getting the components you need now, and let our parts finder help with the rest. This unit fits certain makes and models depending on certain factors, Get started using our compatibility feature to see if your vehicle can fit this specialized unit.